Ryan Eriquezzo, 131st place finisher in the 2010 WSOP Main Event and WSOP Circuit Ring holder, has been eliminated from the Foxwoods Mega Stack Main Event. Brad McFarland had been knocked down to his last 50,000 chips when he got all in with pocket jacks but ran into an opponent holding pocket aces. He could not improve and McFarland was sent to the rail late on Day One. James Woods (seat one) and Rob "veeRob" Perelman (seat eight) are now at the live feature table of the Foxwoods Mega Stack Challenge Main Event. With 170 players remaining, the average chip stack is just under 92,000. David "BigPotsUTG" Servedio, who won the $300 Mega Stack Challenge event earlier in the week, has been eliminated from the Main Event when his pocket jacks could not outdraw his opponent's pocket aces. There are now 194 players remaining and the average chip stack is just over 80,000. Will "The Thrill" Failla has been eliminated from the Foxwoods Mega Stack Challenge Main Event. The players in the Foxwoods Mega Stack Challenge are now on a 10-minute break. With 220 players remaining, the average chip stack is now just under 71,000. In the Foxwoods Mega Stack Challenge Main Event, he probably won't be able to do that. However, he has built his stack up to 203,000 and is now one of the chip leader late on Day One action. 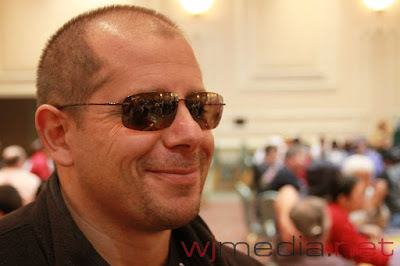 Rob "veeRob" Perelman Rakes a Huge Pot! On a board of [3d][2c][2s], it is checked to FoxwoodsLive.com Live Stream guru Rob "veeRob" Perelman. VeeRob bets out 2,700 and his opponent makes the call. The turn was the [4s] and it is once again checked to Perelman. This time, Perelman fired 6,600 into the pot. His opponent counted out his chips and threw in 26,600. Perelman made the call. The river came the [Qs] and his opponent put out 35,000 in chips. After contemplating his decision for a few moments, veeRob made the call, saying "I can't believe I didn't raise." as his chips are going in the middle. His opponent taps the table and turns up [Kc][Jd] while Perelman showed [4c][4h] for a turned full house. Rob "veeRob" Perelman is now sitting on over 225,000 in chips. With 233 players remaining, the average chip stack is now 67,000. Brad McFarland, who now sits on over 180,000 in chips, is now in the seven seat at our live stream feature table. Just click "Watch LIVE Video" at the top of the page to watch. Ronnie Bardah has been eliminated from the Foxwoods Mega Stack Challenge Main Event during Day One action. Players have returned from dinner break and cards are back in the air. The blinds are currently 400-800 with a 100 ante. The players are now on a one-hour dinner break. Chip counts will be posted shortly. Ryan Eriquezzo, 131st place finisher in the 2010 WSOP Main Event and WSOP Circuit Ring holder, has emerged as another one of our big stacks here on Day One of the Foxwoods Mega Stack Challenge Main Event. With just 20 minutes until players break for dinner, Eriquezzo has chipped up to over 120,000. The blinds in the $1,200 Foxwoods Mega Stack Challenge Main Event have been increased to 300-600 with a 75 ante. With 317 players remaining, the average chip stack is now just over 49,000. Rob "veeRob" Perelman, who just took down the Heartland Poker Tour Event in Las Vegas last month for over $158,000, has steadily been increasing his stack through out the day. Despite losing a flip for about 30,000 in chips a few minutes ago, he has built his stack back up to around 90,000 and sits at nearly double the chip average. With 323 players remaining, the average chip stack is now just over 48,000. With approximately 348 players remaining, the average chip stack is 44,800. We had a total of 390 players in the $1,200 Foxwoods Mega Stack Challenge Main Event. When play resumes, the blinds will be increased to 100-200 with a 25 ante. The final numbers and payouts will be posted shortly. Early on in level four of the Foxwoods Mega Stack Challenge Main Event, Brad McFarland has already reached 100,000 in chips. McFarland took a monster pot with [Js][8s] when the flop came 10-9-7 and his opponent held pocket sevens. They got all the chips in on the flop and the straight held for McFarland. The blinds in the $1,200 Foxwoods Mega Stack Challenge Main Event have been increased to 100-200. The players are now on their first 10-minute break of the day. YouTube video: Jonathan Duhamel Gives the Shuffle Up and Deal! WSOP Main Event Champion Jonathan Duhamel give the "Shuffle Up and Deal" announcement at the February Foxwoods Mega Stack Challenge Main Event. There are currently over 350 players already in today's field with registration open for another two levels. The live stream feature table of the Foxwoods Mega Stack Challenge Main Event is up and running. Cards In the Air at the Mega Stack Main Event! World Series of Poker Main Event Champion Jonathans Duhamel just gave the "Shuffle Up and Deal" announcement and cards are in the air. The blinds are starting at 25-50 with 50 minute levels. Mega Stack Challenge Main Event Set to Begin! The $1,200 No-Limit Hold 'em Mega Stack Challenge Main Event is set to kick off in about 30 minutes. Players start with 40,000 chip and the levels are 50 minutes in length. The blinds will start at 25-50. Stay tuned to Foxwoods Live for all of the updates from the event as well as the live streaming feature table.